Innovative corporate leadership enables ideas to evolve into realities. We are passionate about advancing the science of tissue repair and regeneration. That’s why we’re the driving force in the design, development and manufacturing of advanced collagen and mineral based medical devices that support the body’s natural ability to regenerate. Through our proprietary technologies and innovative products, we’re striving every day to exceed the clinical demands of Dental, Spine, Orthopaedic, Dural Repair and Nerve Repair applications. 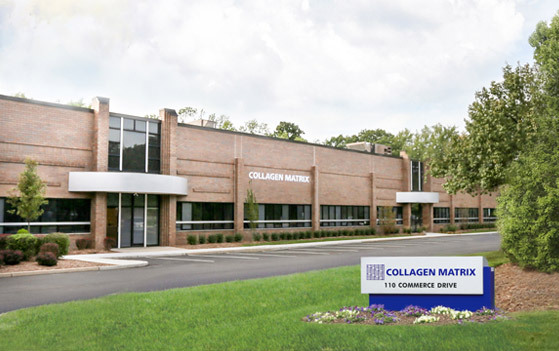 Since our inception in 1997, Collagen Matrix has been awarded significant grant money for the research and development of collagen based matrix products. 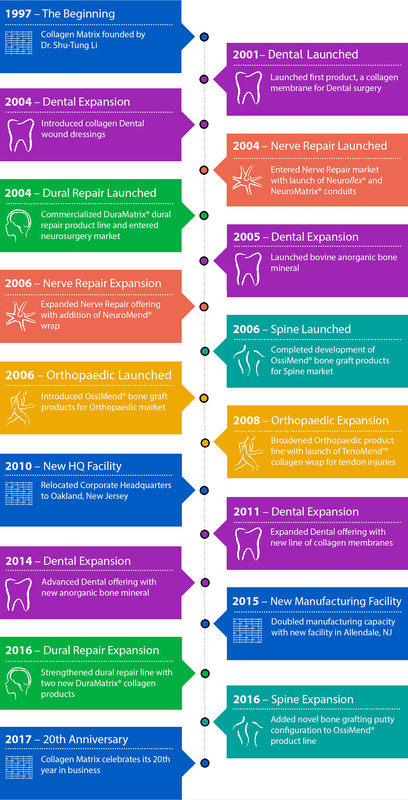 We have expanded into two facilities with nearly 200 employees and have commercialized over 50 medical devices for our five business units – Dental, Spine, Orthopaedic, Dural Repair and Nerve Repair. Our products are now distributed around the world via a substantial global distribution network. Our two facilities are situated in New Jersey, USA. The Corporate Headquarters and Manufacturing site is located in Oakland and the second Manufacturing facility is located in Allendale. These locations provide ample manufacturing capacity to support upcoming new product launches and anticipated expansion. The evolution of the company’s leadership, proprietary technologies, design capabilities, manufacturing expertise and product portfolio has established a solid foundation for continued growth. Our Leadership Team consists of a dedicated group of professionals who blend a wealth of technical expertise with business development knowledge that expands our company’s global presence in the healthcare industry. Mr. Doedens was named Chief Executive Officer of the company in September 2015. Before joining Collagen Matrix, Bart served as President of Biomet 3i, a leading dental implant manufacturer based in Palm Beach Gardens, Florida. Prior to that position, Bart was a Vice President at Sirona Dental Systems Inc., of Long Island City, New York, where he was responsible for leading the CAD/CAM business unit and business development. He also held executive roles at Atlas Spine Inc., Biomet Inc. and Mallinckrodt Medical, Inc. (currently Covidien), where he led strategic expansion initiatives as well as marketing, sales and R&D efforts. Bart holds an M.D. from the Free University of Amsterdam and an MBA from the University of Rochester’s executive program at the University of Rotterdam. Mr. Valberg joined Collagen Matrix in October 2016 to oversee finance and administration as well as the human resources team. 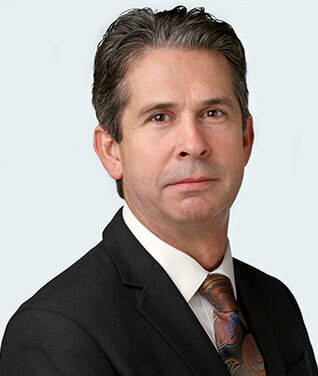 Oystein has more than 20 years of progressive senior corporate finance leadership and business development experience, including 17 years with Medtronic Plc where he earned a reputation as a strong, “hands on” organizational leader. 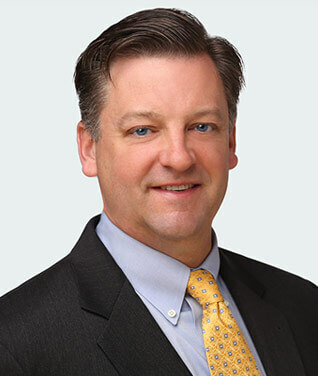 Most recently, Oystein served as CFO and Vice President of Finance, Strategy and Business Development for Medtronic’s Surgical Technology business unit. His valuable experience working with Medtronic also included responsibilities in Corporate Development, Treasury and Investor Relations. 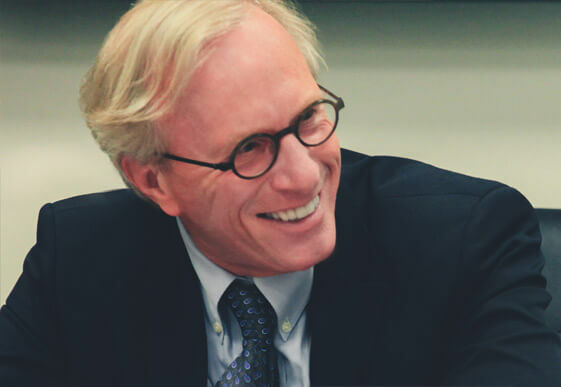 Prior to Oystein’s tenure at Medtronic, he served as an Analyst with U.S. Bankcorp, and as an Auditor for Grant Thornton where he earned his CPA. Oystein earned a Bachelor’s degree and an MBA from the Carlson School of Management in Minneapolis. Ms. Hansen joined Collagen Matrix in October 2001. Peggy has 25 years of experience in the areas of Regulatory Affairs, Clinical Research, and Quality Assurance of implantable medical devices and over 12 years in Business Development and Marketing for Collagen Matrix. Before joining Collagen Matrix, Peggy was the manager of Regulatory Affairs at SurModics, Inc., a company specializing in surface modification of medical devices, where she was responsible for the company’s regulatory affairs and quality compliance. Prior to working at SurModics, Peggy was at 3M Health Care, Medical Products Division and Cardiovascular Systems Division where she was responsible for U.S. and global regulatory filings with respect to the company’s class I, II, and III medical devices and combination products. Peggy was also employed by ReGen Biologics, Inc., a company involved in the development of collagen orthopedic products. She is a certified Regulatory Affairs Professional. She received her Bachelor’s degree in Chemical Engineering from Cornell University. Ms. Yuen joined Collagen Matrix at its inception in 1997. With more than 25 years of experience in the medical device industry, Debbie’s career spans several leadership positions at Collagen Matrix. 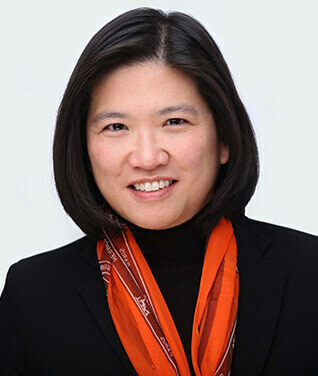 Her current role as Senior Vice President of Operations has her overseeing the company’s global supply chain and manufacturing. Debbie also collaborates with the Research and Development team to prepare for commercialization of new products, while also identifying ways to improve the existing production process. In her operations role, she was responsible for several facility expansions activities including the recent expansion of the 45,000 square foot Allendale, New Jersey, facility. Prior to joining the company, Debbie was a manager of collagen based orthopedic product development at ReGen Biologics Inc., a sports medicine company in knee meniscus development. Earlier she was a research scientist at Colla-Tech Inc., a subsidiary of Marion Merrill Dow Inc. Debbie has been co-investigator of a number of NIH funded Small Business Innovative Research (SBIR) grants, has over 25 publications in the areas of collagen biomaterials development application and is co-inventor of 13 U.S. patents and several U.S. patents pending. Debbie holds a Bachelor’s degree in Biomedical Engineering from Stevens Institute of Technology. Mr. Messer joined Collagen Matrix in June 2016. 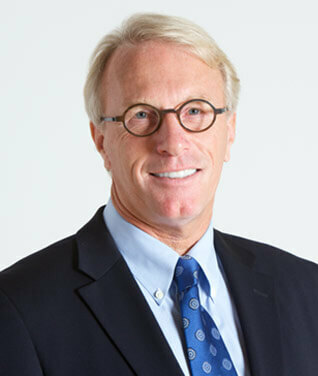 Bill is an accomplished Medical Device executive with over 20 years of marketing and leadership experience. He has extensive experience with business development, marketing, sales force excellence, portfolio management, strategic planning, medical education and thought leader development. Mr. Pomrink, a senior research and development leader, with 30 years of industry experience, joined Collagen Matrix in February 2018. Greg has a well-rounded medical device background having held key positions focused on developing materials for dentistry, sports medicine orthopaedics/spine, and neurosurgery along with plastic and reconstructive surgery applications. He has a proven track record of success having had a leadership role in the design, development and launch of more than 35 medical devices along with having 17 issued patents and several applications pending. Prior to joining Collagen Matrix, Greg held senior research and development positions with LifeNet Health, NovaBone Products, Integra LifeSciences, Dentsply and Orthovita specializing in providing leadership while managing the design, development and commercialization of medical devices for the regeneration of bone and soft tissues. He holds a Bachelor of Arts degree in Chemistry from Temple University along with a Master of Science degree in Chemistry from Lehigh University and a Master of Business Administration degree from Eastern University. 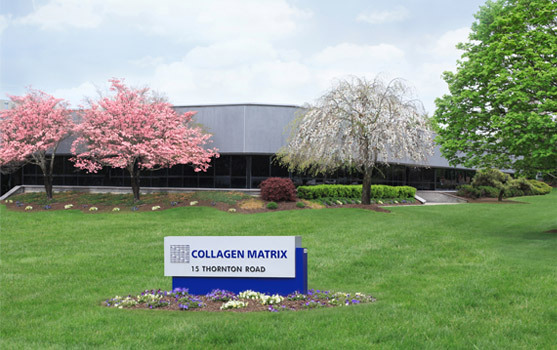 Collagen Matrix was founded in 1997 by Shu-Tung Li, Ph.D. He was the President and CEO until September 2015. He then served the company as the Chief Scientific Officer until his retirement in March 2018. Today, Dr. Li is an Advisor and Board Member for Collagen Matrix. 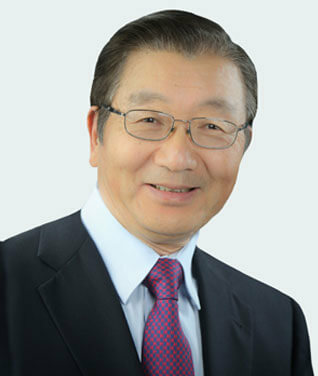 Dr. Li has over 40 years of experience in connective tissue research and collagen and mineral based implant development, which includes 10 years of basic science research experience at the University of Connecticut Health Center related to the structure and function of collagen fibrils in mineralized and non-mineralized tissues and over 30 years of experience in collagen based and mineral based implants development in the medical and dental industry. Dr. Li was awarded 11 NIH grants (SBIR and R01) from 1997-2003—totaling $8 million. He has authored over 90 publications in basic and applied sciences in collagen and mineral based materials. He has been awarded 34 U.S. patents, and in 2012 was inducted into the New Jersey Inventors Hall of Fame. Dr. Li was awarded Executive of the Year in 2009 by NJBIZ and CEO of the Year-Private Company by the New Jersey Technology Council in 2014. Prior to founding Collagen Matrix, he was the Co-Founder, Executive Vice President of Research and Development and a Board Member at ReGen Biologics, Inc., an orthopaedic company specializing in the development of meniscus repair devices. He was awarded the German-Austrian-Swiss Society for Orthopaedic-Traumatology Sports Medicine (GOTS) Biersdorf Research Award for the Collagen Meniscus Implant in 2000. In his career, Dr. Li also held management positions at Colla-Tec/Integra Lifesciences and Meadox Medicals/Boston Scientific. He received his Ph.D. in Physical Chemistry from the University of Connecticut.